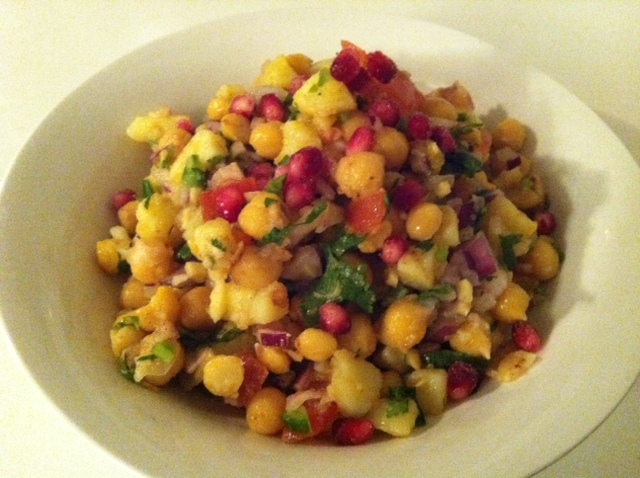 This has been inspired by an Indian/Pakistani street food Channa Chaat –the only difference is that I added pomegranate seeds to the mix, which although it made it more vibrant and colorful also lent it great taste. I usually freeze my pomegranate seeds for times when they are not in season. 1) 1 cup of uncooked chick peas, soaked overnight and cooked. Do not overcook them or else you might as well just turn them in Hummus. 2) 2 big boiled potatoes, peeled and chopped. Do not over cook, so that they hold their shape when you cut them. 7) 1/2 tsp fine sugar of better “Jaggery” which you can buy from South Asian [Indian] stores . Roast each of these separately: 1 tblsp cumin seeds, 1 tsp fennel seeds, 1 tspn ajwain seeds (optional), 1 whole red dried chilly, 1 tblsp coriander seeds. Then add 3-4 black peppercorns, 1 tblsp of garam masala, 1 tblsp mango powder (called Amchur and is sold in Indian Stores), 0.5 tblsp black salt (also sold in Indian Stores], 1 tsp chilli powder, 1/8 tsp of asafoetida powder, 0.5 tblsp of sea salt, 1 tspn cloves, 1 tspn nutmeg, 1 tspn cardamom powder or seeds, 1 tspn cinnamon powder. Grind them in a spice grinder and store in a jar. Mix ingredients 1-11 together and then add 1/2 tsp of the spice mix and keep on tasting until it is to your “heat level’–if you add too much it will be too hot for you to eat.Refrigerate for a couple of hours, and serve cold. This makes for a wonderful snack.